I am happy to report that our area is no longer “abnormally dry.” It is however, abnormally hot and humid. I have been moving plants in the cooler part of the day and keeping busy in the house the rest of the time. I’d thought I’d show you some highlights from August. 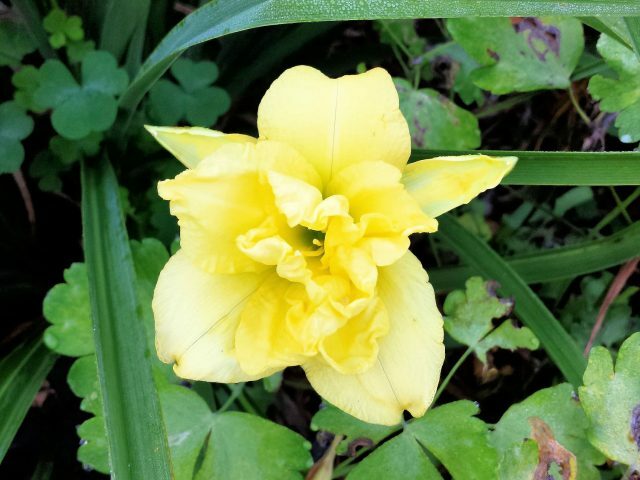 Love my yellow daylilies, single or double. I love them so much I created a border along the road to feature them. The roadside border is in its second year, and it’s starting to hint at the effect I’m hoping to achieve. I thought these Tropicanna Gold cannas would add some height to the border, but they still haven’t grown higher than the daylily foliage. What’s up with that? They’ve had heat, they’ve had rain, and they look perfectly healthy, but they seem to be treading water, neither growing nor dying. 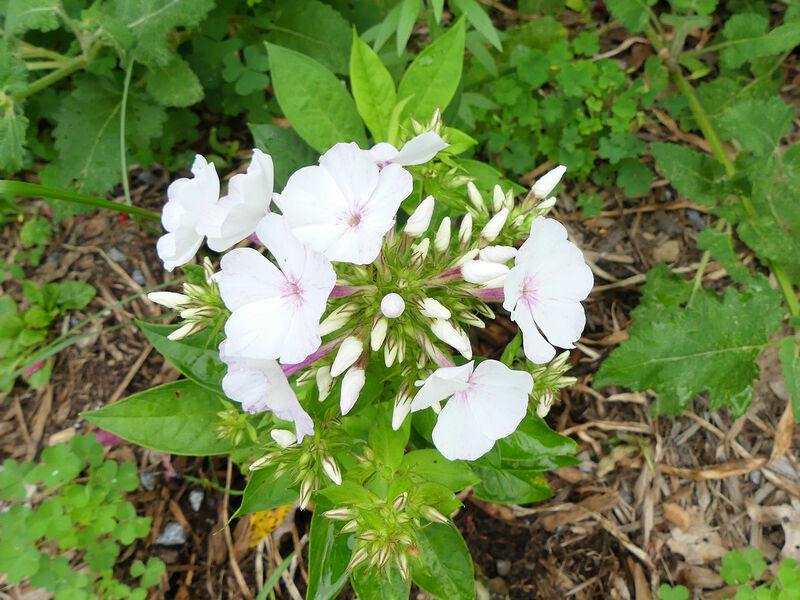 I got this phlox as a teeny, single stem division from the rock garden club plant sale last August. I wasn’t sure it would even make it to spring–but it did, and even has a second stem. It was labeled ‘Flame Light Pink’ but now that it’s bloomed, I think it’s ‘Flame White Eye’. Apparently the Flame series of Phlox paniculata is bred to be quite short, which explains why the division was so tiny. Now that I know that, I’ll probably move it sooner or later, as you can hardly see it where it is. 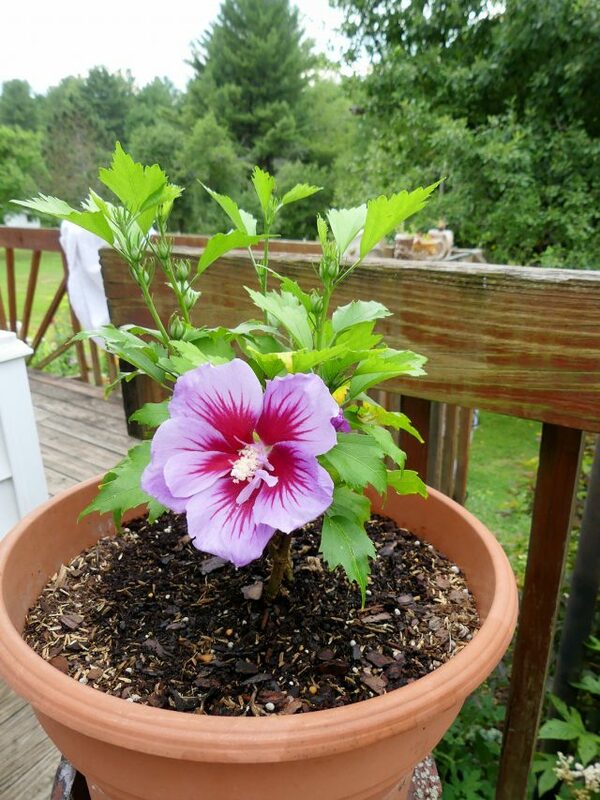 Speaking of small, check out this Purple Pillar rose of Sharon. Proven Winners sent it to me to try out–it’s a new introduction of theirs. It’s supposed to get as tall as a typical rose of Sharon (10-16ft; 3-4.9m) but only 2-3 feet wide (.6-.9m). I’ve got it in a pot right now because I’m still figuring out the best place for it. Hmm…where do I need a vertical accent? Can you imagine a whole allée of them? This is my first year growing ‘Lacy Blue’ didiscus (Trachymene coerulea). The blue is more of a light lavender to my eye. I thought they would provide a nice accent in bouquets. You can probably see from the wallflower in the background that the color works well with orange. 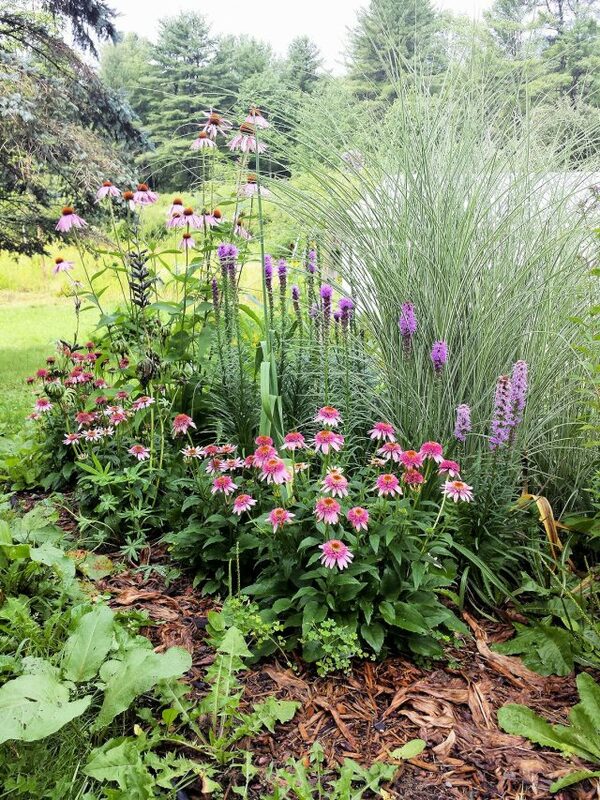 I decided to pair ‘Butterfly Kisses’ echinacea with the taller, straight-species coneflower. …and this is what you see, now looking up the slope. 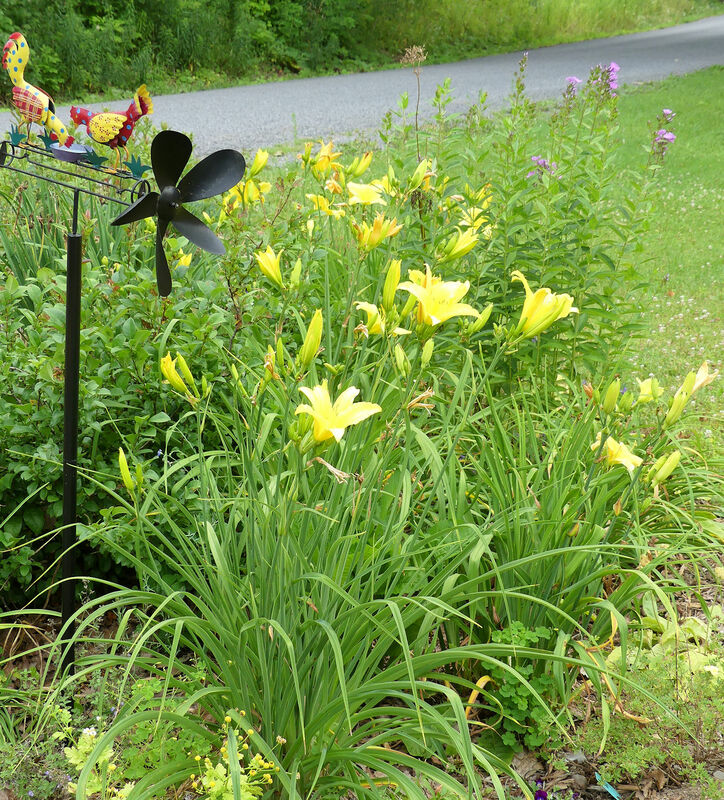 I’m still not sure those daylilies “go” with the rest of the planting. What do you think? This last one is not new, but every time it blooms I marvel anew that I managed to grow it from seed. My grandma wrote “Pink Trumpet Lilies” on the seed envelope, but I’m pretty sure this is Lilium regale, the Chinese trumpet lily. (You can read that story here.) Extremely tall and extremely fragrant, they make sitting on the front terrace a perfumed delight. 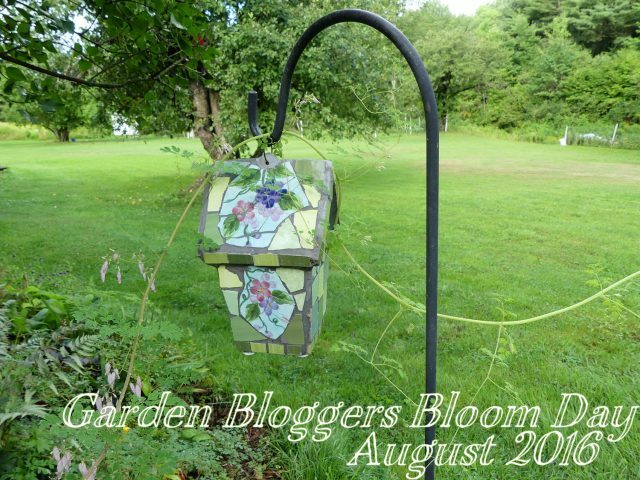 My 14th anniversary of blogging is coming up later this month, so just for fun I’d thought I’d link to my other August Bloom Day posts. Apparently the first year I participated was 2008. 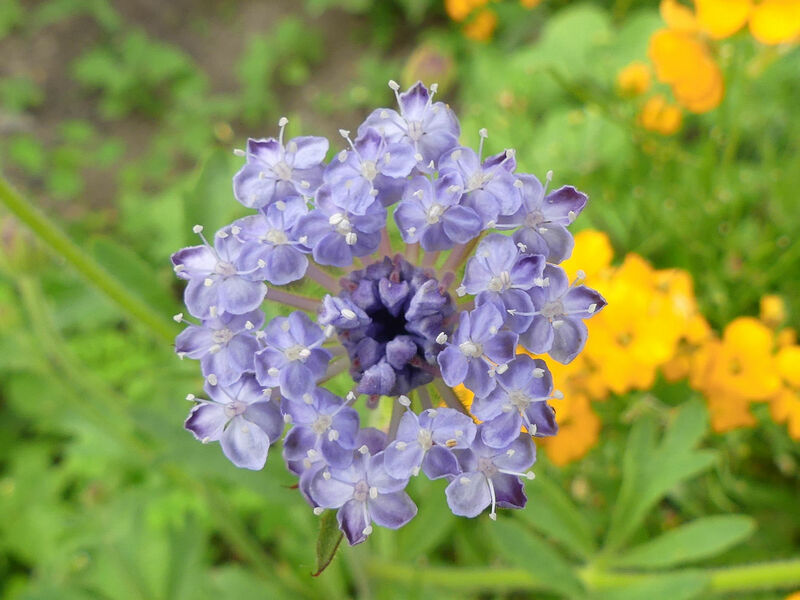 I am a fan for didiscus especially in blue color. I have planted some at my garden and they just enlighten me everyday. The lacy blue flowers look lovely; they’re low-maintenance annuals that ideal for sunny borders, cutting gardens or flower beds, where they provide sweetly scented blooms from late summer until the first frost. These old-fashioned charmers also look great in containers and when they grow, can reach a height of 24-30 inches. Gorgeous garden photos, sadly our drought persists and has really started to exact a price on our entire landscape. Congrats on 14 years! These days everything comes and goes so fast, that is quite the accomplishment. Your canna looks extremely healthy, I can’t imagine why it hasn’t taken off. Maybe it needs a new home? I don’t know if Purple Pillar sets seed. Mine doesn’t seem to have yet, but since it’s had no more than half a dozen blooms on it so far, that isn’t really a convincing argument. 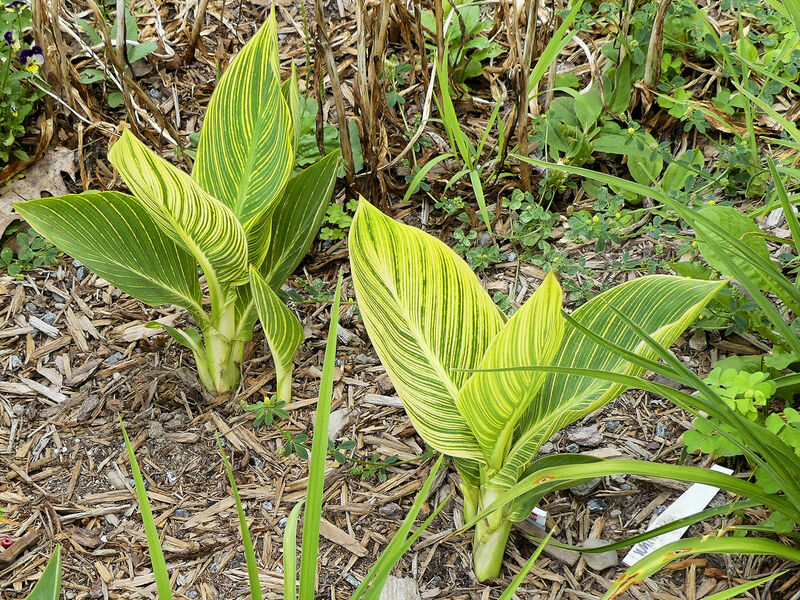 As for the cannas, looking at photos from last year, they didn’t really get big until, um, October. Just before the first frost. Just like fruit trees need a certain amount of chilling hours, perhaps cannas need a certain amount of heat hours? That’s my best theory. Also, I don’t think they really get a full day of sun. It’s just the wrong plant for that spot. Next year I’ll try something else there. All images are looking very colorful and lovely. All were grown in your garden? 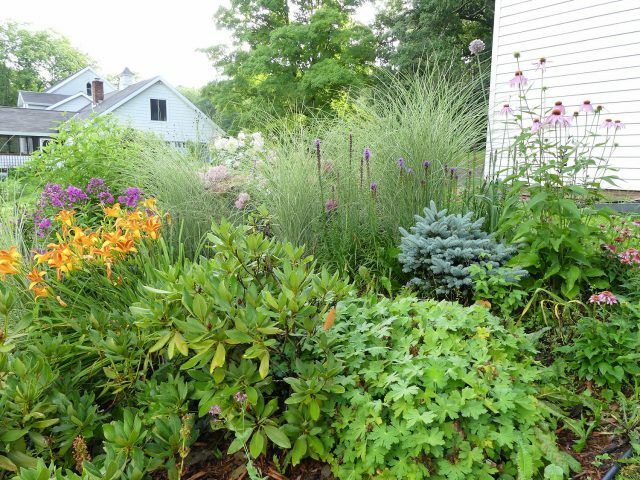 I have reed this post very carefully.This video is also helpful for every one.I most like your blog.I hope you give more article about gardening.Thanks for this post. Kathy, what an accomplishment — 14 years of blogging! I can’t imagine continuing for that long — I’m too old! 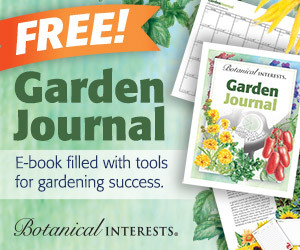 So congratulations on the blog AND the garden in August. We finally had some rain, the slow steady type that actually helps. Not enough yet, but a lot better than none at all. My Cannas tend to stay on the shorter side too. I think I’m just not generous enough with the juice. I hear they really like water! Rain! We are actually receiving rain today – I want to thank the gods! I hope it cools down for you Kathy. Your gardens look beautiful. I planted Tropicana Gold and it too, didn’t grow very tall, but Tropicana Black grew as expected. I attributed it to the cooler summers we have but that is certainly not the case this year! Such beautiful lilies! I think lilies are one of those plants you can plop in any border or garden and they belong. They are reported as hardy to USDA Zone 5. Canadian hardiness zones are not strictly equivalent, but Manitoba may be too cold for it. But I think if you can get it through the first couple of winters it will be fine once it has a decent root system on it. I love that double yellow daylily. Ours are just finishing now. Finally getting rain here in the St Lawrence River Valley north of the Adirondacks. Thanks for the update, love your blog! August-Sitting on the porch takes precedence over weeding in the hot sun. Love your blooms, Kathy. In up the slope- I like the contrast of the daylilies with the lavender/ purple plants and I would make three clumps of them spaced strategically. In Southern Maine, we are still in drought conditions.Always enjoy your writings! Lovely flowers. 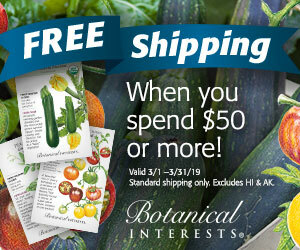 Your garden looks amazing ! Dear Kathy, thanks for the wonderful update! I think your day lillies “go” there, but it would be nice to have them of a pastel pink colour to complement the existing colour-grade! That view looking up the slope is beautiful! Great combination of plants! How interesting about the Cannas. The rain “does your garden good”. A good showing for August, thanks for joining in! 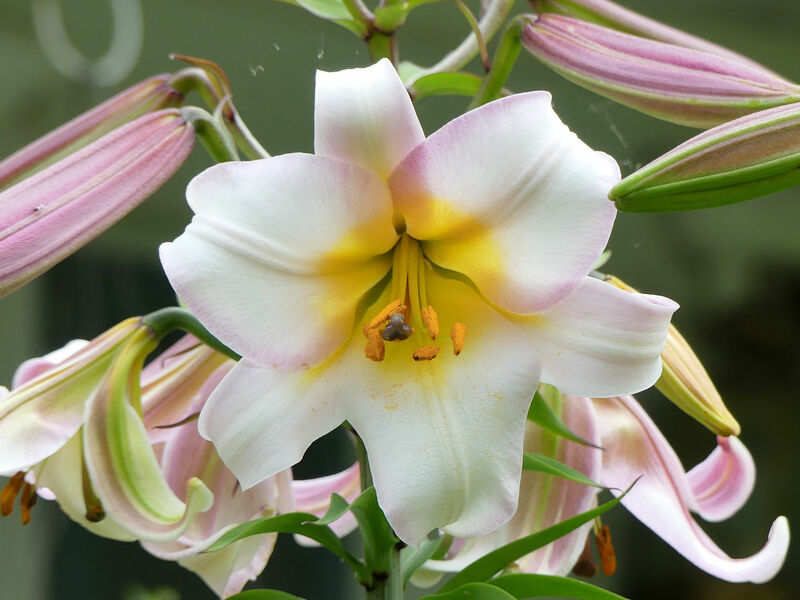 Whatever the trumpet lily actually is, it is very pretty! Your August garden is lovely. Yes, it’s an annual. I bought my seeds from Fedco. I was hoping they’d bloom in time for my son’s wedding but they didn’t start until later in July. We had plenty of other flowers for the wedding . . .